The Rainforest Alliance works to conserve biodiversity and improve livelihoods by promoting and evaluating the implementation of sustainability standards in a variety of fields. It provides forestry, agriculture and carbon/climate clients with independent and transparent verification, validation and certification services based on these standards. Smallholder farmers in developing countries have learned through experience that adopting the sustainable practices required for Rainforest Alliance certification can lead to higher prices, increased efficiency, access to international markets and resilience to challenges like climate change. Yet the financial investment that certification entails can pose a significant obstacle for farmers with limited access to financing. Sometimes aid organizations or corporations will help pay for these improvements and the associated training, but a more sustainable and scalable solution would be for farmers or cooperatives to borrow the funds themselves. Few lenders, however, consider small agricultural producers to be attractive borrowers – and not without reason. Farmer cooperatives and small and medium-sized enterprises (SMEs) often lack sufficient collateral. Moreover, lenders consider agriculture to be particularly risky; farms are often located in remote areas, crops are vulnerable to pests and unpredictable weather, and prices are susceptible to rapid changes. Furthermore, smallholder farmers and cooperative management often lack strong business and financial management skills, making it difficult for them to apply for and manage a loan. These risks can turn even a short-term loan into a bad investment. To help address these challenges, the Rainforest Alliance launched its Sustainable Finance Initiative, which helps farmers and SMEs access different types of loans. For example, SMEs that are working towards certification may require financing to increase pay for workers, improve worker safety, build waste management systems and install new water-conservation technology on their farms. Or smallholder farmers, usually with just two and a half to 10 acres (one to four hectares) of land, may need to invest in composting, personal protective equipment and proper storage for chemicals. Farmers and small cooperatives rarely have available funds for these investments and often struggle to find the capital. By helping farmers invest in responsible management practices, we are supporting sustainable livelihoods while conserving biodiversity. Our Sustainable Finance Initiative may also help attract and retain producers in the Rainforest Alliance certification system and distinguish ourselves from other certification bodies. The Rainforest Alliance is working to foster connections between producers and financial institutions, under the premise that farms and forestry enterprises that have done the legwork required for certification are more creditworthy than those who have not demonstrated a commitment to sustainability. First of all, certified farms help many lenders fulfill sustainability requirements for their portfolios. Second, certified producers have better access to the growing market in certified sustainable goods, and the Rainforest Alliance works along the entire value chain to bolster this area of consumer demand. Finally, the certification process itself involves technical and businesses management training, as well as periodic audits – all of which makes for more reliable creditors. 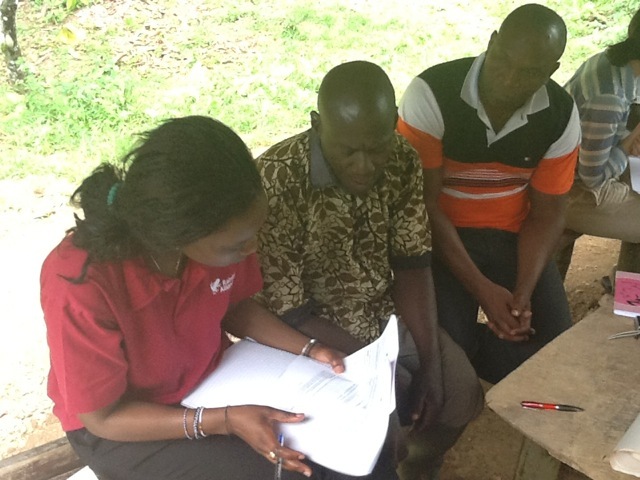 (Above: Sarah Fadika, Rainforest Alliance Associate for the Cocoa Program, interviewing farmers about their financing needs. Image credit: The Rainforest Alliance). A recent study commissioned by the Rainforest Alliance supports our vision, as well as the raison d’être for the Sustainable Finance Initiative. The study, titled Farm Level Metrics that Matter, surveyed 110 producers in Colombia and Peru, half of which were Rainforest Alliance CertifiedTM and the other half noncertified. Results revealed that certified farmers were awarded larger loans than noncertified farmers, securing an average loan of $5,562, compared with $3,311 for non-certified farmers. The frequency of loans was also higher for certified producers, who received on average 1.36 loans per year, compared with 0.66 for non-certified producers. In addition, the study identified 25 key indicators that farmers should record in preparation for a loan application, including production, revenue, expenses and relationships. Our Sustainable Finance Initiative designs training programs to help farmers keep track of these indicators. In addition to supporting sustainable financing for producers, the Rainforest Alliance advises loan officers about sustainable management and how it helps mitigate risk. Recently, we held workshops in Costa Rica and Peru for loan officers at Root Capital, a social lender that provides credit and financial management training to small agricultural enterprises and farmers in Latin America and Africa. As part of the workshop, participants visited two Rainforest Alliance Certified farms and learned about the principles of sustainable agriculture, and how it reduces vulnerability to pests and diseases using natural methods. This workshop was designed to help Root Capital improve its ability to underwrite loans for producers with strong environmental performance, while reducing costs and risks across the value chain. In the future, workshops will be offered to local loan officers at other institutions and in different regions. For now, our Sustainable Finance Initiative mainly works with cocoa and coffee farmers in Latin America, East Africa and West Africa, as well as forestry enterprises in Central America, and we have plans to expand to other crops and countries in the future. Over time, we will integrate our work with all of the Rainforest Alliance’s global programs in sustainable forestry, tourism and climate change -other sectors in which where access to funding can play a significant role in protecting biodiversity and improving livelihoods. Michelle Buckles is the director of Sustainable Finance at the Rainforest Alliance. She is responsible for evaluating the financing needs, capacities and solutions for businesses participating in the Rainforest Alliance’s sustainable agriculture, forestry, tourism and climate programs.